The idea for the gazebo Megan’s Den came about from Megan’s love of school and the idea of having a permanent memorial to be placed at Gayton Primary (then First) School to be used as a outdoor classroom and social meeting place for the pupils and also the parents. Initially the memorial was on a much smaller scale funded from donations from Megan’s funeral, Gayton School and Brigadier Phelps Trust. Stephen and a group of close friends decided to boost funds by completing the first “Megan’s Challenge”, this doubled the money raised and enabled us to provide a larger gazebo and to secure funds be able to maintain it on an ongoing basis in the future. Working closely with the school and the joinery company J M Whitby of (Robson Construction) who were constructing the gazebo, the plans were put into place and Megan’s Den was built, then with the end of the School Summer Term approaching the gazebo was erected in time for the school children to have their own opening ceremony on 21 July 2011 where they said a prayer written by them, for Megan. They were also able to use the den as part of the End of Year Celebrations. 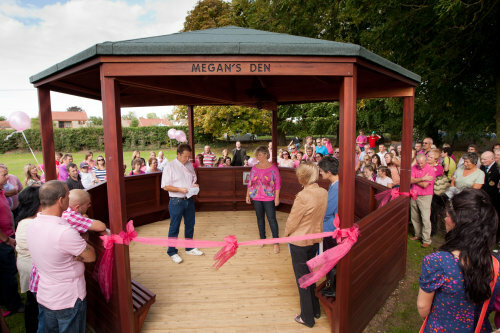 On Saturday 10 Sept 2011 the official opening of Megan’s Den was held and her memorial plaque and butterfly where put into place in the gazebo. Stephen and Mrs Duggan (Head teacher) said a few words and Rev. Jane Holmes said a blessing and prayer. This was followed by a very successful and enjoyable hog roast and raffle at Gayton Social Club.